Your 2018 #AETourney Most Outstanding Player is @BlackBearsWBB’s Blanca Millan! Congrats to all the players and coach Vachon. Great Win ! They'll move a team up or down one seed line to regionalize the first and second round, but not two. No chance they play Connecticut. dunbar wrote: They'll move a team up or down one seed line to regionalize the first and second round, but not two. No chance they play Connecticut. Maine will likely be a #14 seed and likely playing at Tennessee or Florida State according to all the experts. Well, that was a pretty good day, wasn't it? Worried through the first half, but at halftime told the friend with me that Blanca and Tanesha hadn't been in the offense yet we were still tied, so Maine would be OK. Blanca starts out the second half scoring, what, the first seven points? Tanesha starts grabbing boards and filling out the stat sheet left to right. I have to say, and I admit I am prejudiced in her favor, that Tanesha deserved a spot on the all-tournament team more than did Carlie Pogue, just in terms of her value to her team. Pogue was a huge element in UNH's success, but she had no answer for Maine's defense and Tanesha had answers for everything that was thrown at her. Gotta agree with whoever posted that Amy Vachon outcoached Kim McNeil. And McNeil had a good game plan. Amy just got a step ahead of her at halftime, I believe. McNeil had her team really ready for Maine. But the adjustments that came out of the locker room meant Maine wasn't just responding to what UH was doing, Maine was forcing Hartford to respond to what Maine was doing. Anyone notice that Hartford often went with a five-guard set with no one in the paint? That surprised me because Hartford had a bit of a height advantage and has two high-quality posts in Janelle Harrison and Darby Lee. Putting them both on the perimeter worked in the case of Harrison because she shot 100 percent but not for Lee who had perhaps her poorest game of the 10 she has played against Maine. She has eaten right off Maine's table for four years. Sierra DaCosta played really well but was not the scoring force she had been against Albany. Her defense was strong, but so was Maine's defense against her. Speaking of filling out the stat sheet left to right, look at Fanny Wadling: 10 points, eight boards, six assists and three steals. And playing in a bit of foul trouble late. With all the attention that has gone to Tanesha, Blanca and Parise, Fanny may be Maine's secret weapon. I know she is a worker, and her defense has been strong for a while, but her improvement may well reflect not only on her work but on the coaching staff working with her. And, Julie Brosseau appears to be back. She has had a really tough time of it lately, but her shooting kept Maine in the game, especially in the first quarter, not to mention four boards, three assists and a steal. Bien accompli, Julie. Dor's value to the team continues to grow. Hartford had somebody in her shorts all day but she stayed calm. Still don't like so many soft passes as Maine made, especially in the first half, but Maine committed barely half the number of turnovers that Hartford forces on average, and a lot of that credit has to go to your point guard. The freshman point guard. Hartford is my favorite AE program after Maine. Folks down there have always treated us well. The Chase Center is very comfortable and cozy -- yesterday's Cross Center crowd would not have fit in Hartford's building, I believe, even if the endzones were full. Hartford is always competitive and gritty, and I don't recall any Hartford player that I would describe as dirty. May have been some, but I didn't catch it. Really a nice rivalry in which a good program always wins. And, Hartford almost pulled off the hardest thing to do in an eight-team tournament, beat No. 3, then beat No. 2 and then beat No. 1. Two out of three isn't the prize those kids wanted when the tournament started, but they have every reason to be proud of their effort. 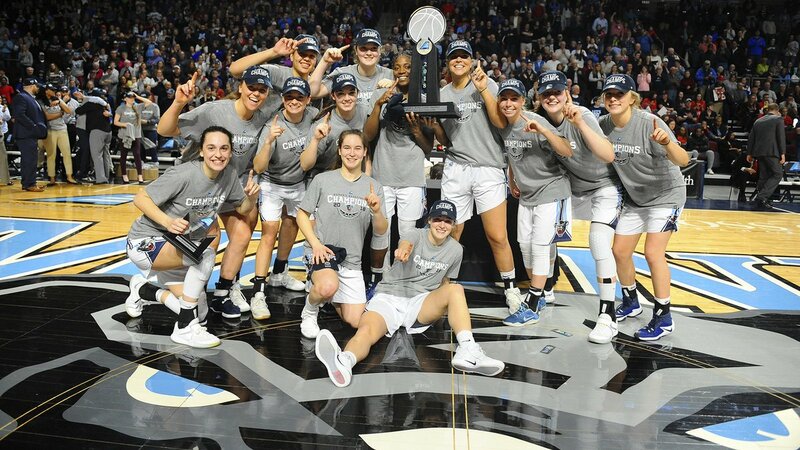 Hartford was no more a true six seed than Maine was a legitimate six pick in the pre-season coaches' poll. Glad that more of their crowd showed up that it had appeared would happen. And they were ready with signs and noise, too. Good fans for a good program. Great post turkey. Maine goes in as a 14. At Florida st is my guess. Bob, as usual your reviews are spot on enjoyable to read especially the insight you get by traveling on the road with the Black Bears. I have only caught 3 in person, Albany, UNH and last nites of course, referring takes up all my free time. Thank god for streaming on the other games. This team is so easy to like, no attitudes and they really don't care who scores or is named first team , that was so evident in the awards ceremony, so glad ESPN showed that, did you notice nobody left the Cross after the game was over. The atmosphere and crowd was such a factor and you can better understand how Albany managed to win the last 6 championships at their place. Getting to host this game is crucial to going dancing. For the game not sure I can remember 3 players making different runs in each quarter to carry us. Julie carried us in the first, Parisse with 9 in a row in the second and Blanca taking over in the 3rd quarter. The 4th seemed to be that total team effort. So impressed how much Dora has improved and wants the ball in her hands and Julie is not hesitant to attack the hoop as well. Those two plus how much more confident and stronger Fanny looks and of course Parisse's unbelievable tourney run along with the consistently strong play of Tanessha and Blanca make this a totally balanced team. Nothing but pride and smiles on all the fans after the game. 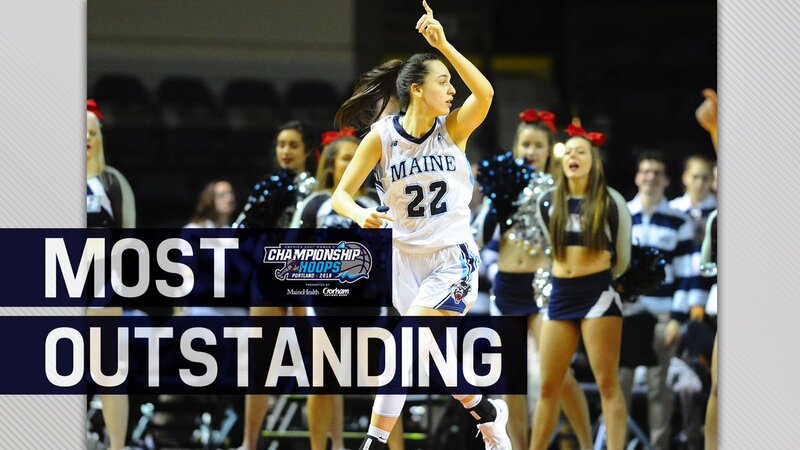 This is what makes following UMaine athletics so much fun. We are all Mainers and feel so engaged with teams when they have this type of success. One minor, minor issue as I was so looking forward sitting next the 200 students in section 117 to see just how crazy and supportive they would be. That didn't happen first thing is half the fans were not students and if they were students they were not engaged any more than other fans but that did not affect the electricity of the Cross. Loved the guys in 116 in row one, know a couple who are AD's and HS coaches and they were leading cheers and totally involved. Just a great, great time and so happy for this team and the University. Wouldn't mind a rematch with Ohio State. They look like they may be a #3 seed.